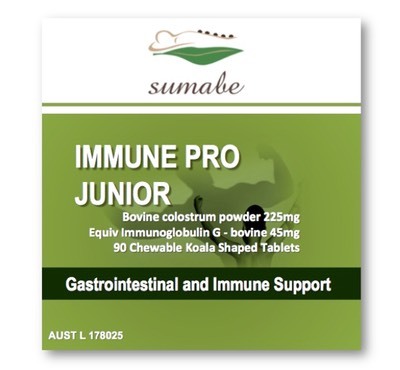 Sumabe® Immune Pro & Immune Pro Junior is made from Colostrum which is the milk that is produced by new mothers during the first few days after birth. It provides a concentrated source of nutrients for new born babies, as well as antibodies to support immune function and growth factors to aid healthy gastrointestinal development. Bovine colostrums contain immunoglobulins, which help to maintain healthy immune system function. 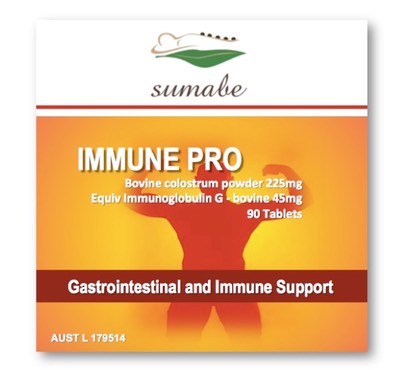 Immune Pro helps to maintain a healthy digestive tract and maintain general wellbeing. Adults: Take 2 tablets 2-3 times daily, or as directed by your healthcare professional. Children: Take 2 tablets 2 times daily. Products containing bovine colostrum powder contain lactose and cow's milk proteins. This product is not suitable for use in children under the age of 12 months except on professional health advice. Colostrum is the milk that is produced by new mothers during the first few days after birth. It provides a concentrated source of nutrients for new bornbabies, as well as antibodies to support immune function and growth factors to aid healthy gastrointestinal development. Bovine colostrums contain immunoglobulins, which help to maintain healthy immune system function. Supports the health of the digestive system & helps to maintain a healthy digestive tract.